Picture an animal shelter — any animal shelter. Chances are, you're imagining a room full of animals, each housed individually in their own kennels. It's loud — dogs are barking — and there are a lot of people coming in and out visiting or cleaning up. Much of that is happening just out of sight for the pups. For some dogs, the chaos is no big deal. They can handle it. But for others, it's too much stimulation and stress, and they begin to shut down. They curl up in a corner of their kennel and shake. 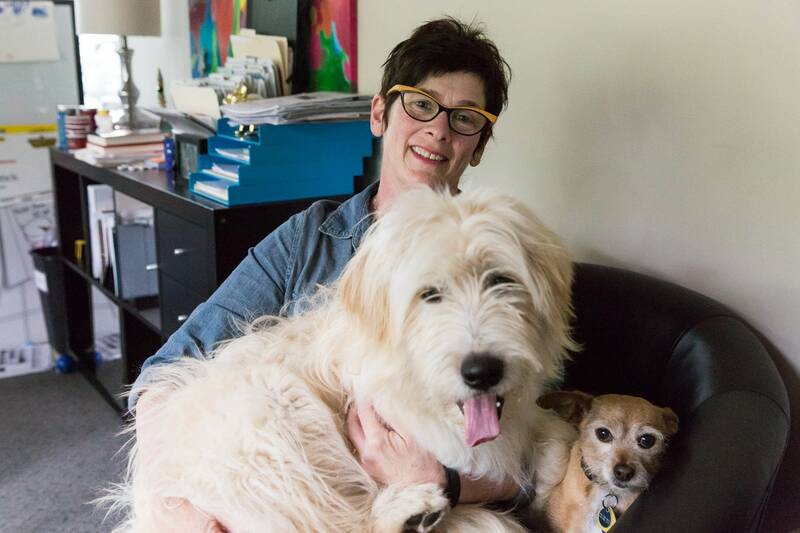 For those dogs, change is on the way — at least here in the Twin Cities. 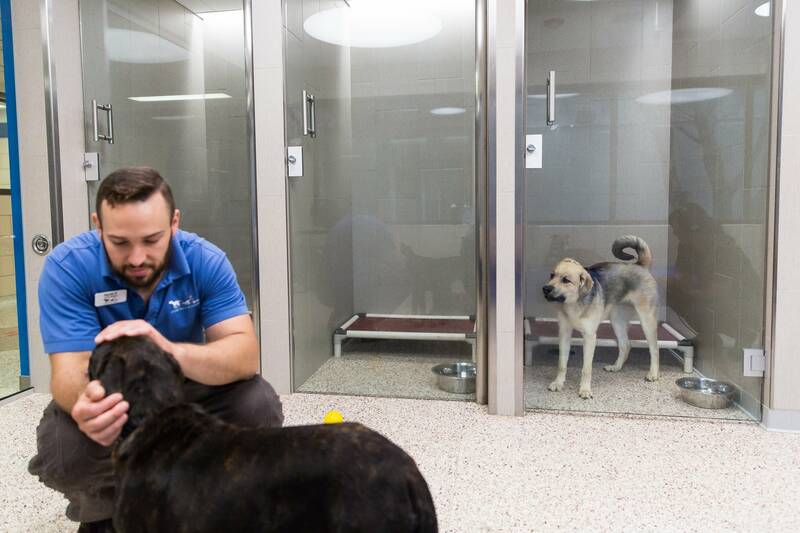 Earlier this week, the Animal Humane Society in Golden Valley unveiled a new dog habitat prototype that changes not only the way dogs there live and interact with one another, it also changes the way people can bond with the dogs. That, in turn, can help a dog's chances of finding its forever home. 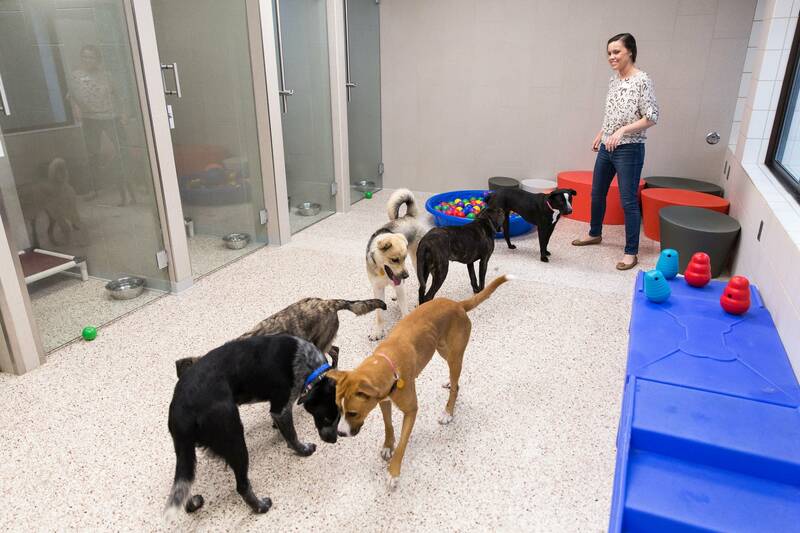 Instead of housing animals individually, the new space allows for up to six dogs to live together in a shared room. Each still has their own den, where they rest and eat, but for much of the day they live and mingle with one another in an open play area. And when potential adopters visit, they're more likely to see a dog's true personality. The habitat is believed to be the first of its kind in the country for shelter pups. It's a much more natural setting for dogs, said Liv Hagen, the humane society's behavior modification and rehabilitation manager. "Dogs are social animals. It's the piece they really miss out on when they're in shelter," she said. In traditional housing, dogs are in their own runs. And while they can hear and smell other dogs, they can't see them. They can't socialize with them. They can't even interact much with the people in the room unless those people walk right in front of their kennel. It can be overwhelming for some pups. "Dogs in shelters are usually going to degrade over time," said Dr. Graham Brayshaw, director of animal services at the humane society. "This is not the right environment for them. They're not really built to be individually housed and not get much interaction, much enrichment during the day." The new housing, though, gives them that socialization that they crave — and need. And Hagen said staff are already seeing that it's working. "We see calmer behavior in visitation to customers, we see dogs really napping and just kind of hanging out during their break times instead of panting and barking, or demonstrating behavior that would denote some stress," she said. "We see dogs truly acting like dogs and we see dogs teaching other dogs how to act like dogs as well." Take Biscuit, for example. 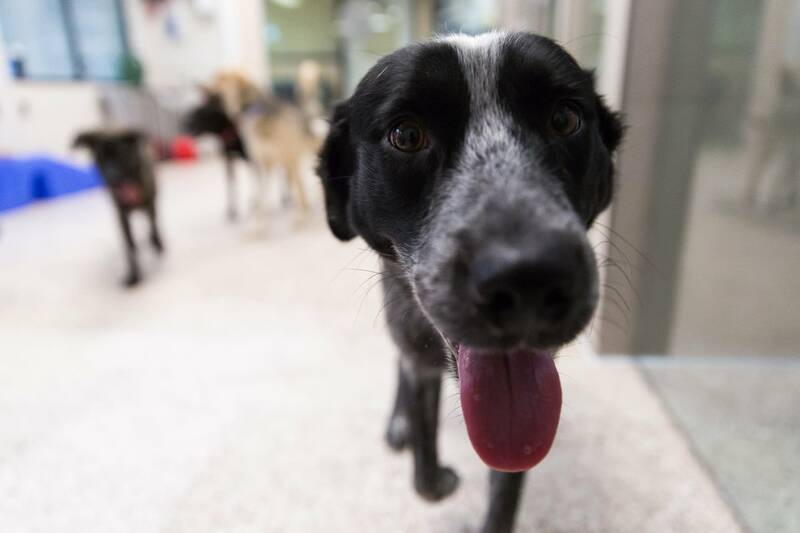 When the shy 2-year-old labrador shepherd first came to the shelter, she didn't really want to interact with other dogs, said animal care technician Kevin Feeback. He's among the staffers who supervise the dogs in the new space. "But slowly, she's becoming more socialized and mingling with the dogs," he said. "So it just really opens up shut-down and shy dogs. It's really nice to see." Lowering the stress level of the dogs can also improve their overall physical health, Brayshaw said. Animals are exposed to a lot of parasites and diseases when they enter a shelter, and the stress and anxiety don't help. "If you're in a more stressful environment, that will suppress your immune system and what could be an easily cured infection can become much more serious," Brayshaw said. "If you decrease the stress levels, you do need less medication, less treatment. The body will treat itself." The group housing prototype has been in the works for a few years, when employees began discussing how they could better care for the animals at their shelters. 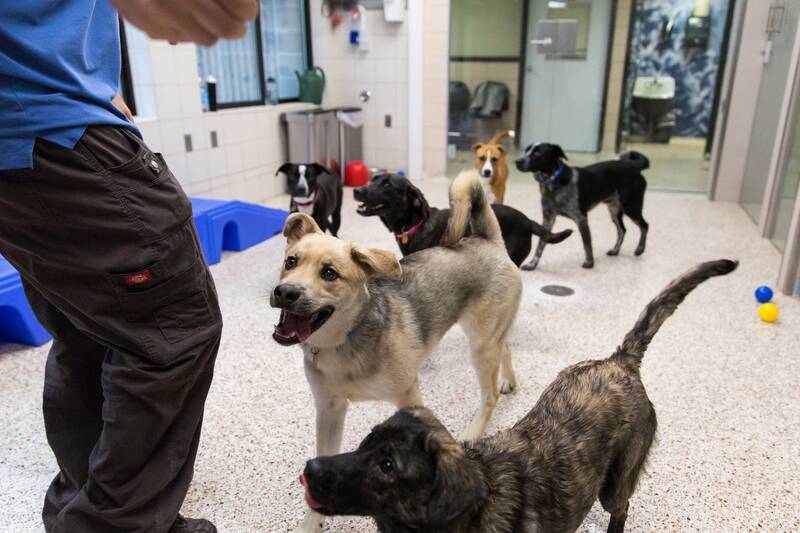 Janelle Dixon, the humane society's president and CEO, said the agency will eventually replace its 65-year-old St. Paul facility — the humane society has four in the Twin Cities — and this gave them "a chance to do something different," she said. Staff began by touring about a dozen other organizations across the country to see if they were doing anything innovative, and what. But they didn't see much change from traditional housing, so staff went to the drawing board and developed their own concept. Anne Johnson, director of shelter services, managed the project. It was designed with both dogs and people in mind. "We want something that is aesthetically pleasing, that is a fresh welcome space that makes people want to enter," she said. "Things that are warm but also things that can be cleaned, things that the dogs can't destroy because they are hard on their environment, in the best ways." Construction began in January in the space that formerly housed bunnies and other small critters. Those animals have since been relocated to another space nearby. 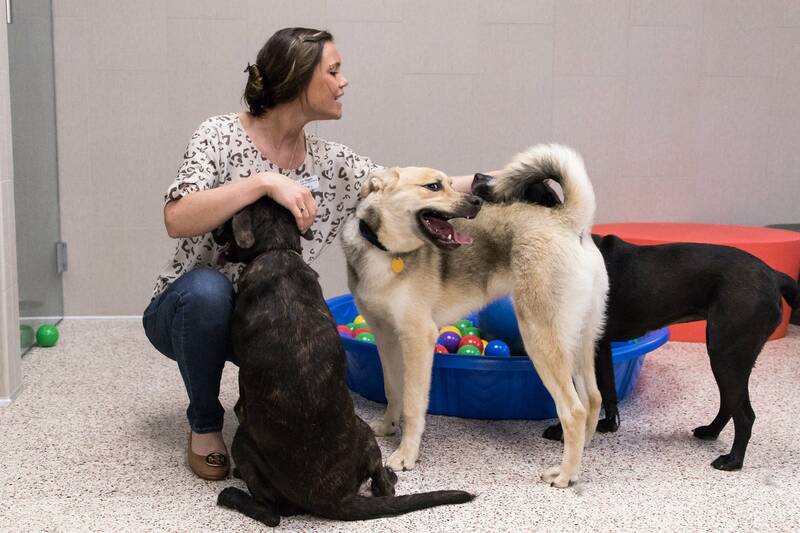 The new habitat opened to the public Monday, who are welcome to enter and socialize with the dogs during open hours. In the months that follow, the humane society will evaluate what's working and what's not. That includes everything from testing the material in the space — warm light versus cool light — to looking at how many dogs are ideal in a group to even what kind of toys work best for dogs in the space. They've already discovered a few things along the way, like what kind of handles and locks not to use. "We've had some real smart dogs that figured out door handles pretty quick," Johnson said. "We have thumb locks and I have a picture of one of them, and you can see where a dog was trying to bite on the thumb lock with his teeth. So he must have been watching, 'this is how they're doing it.' 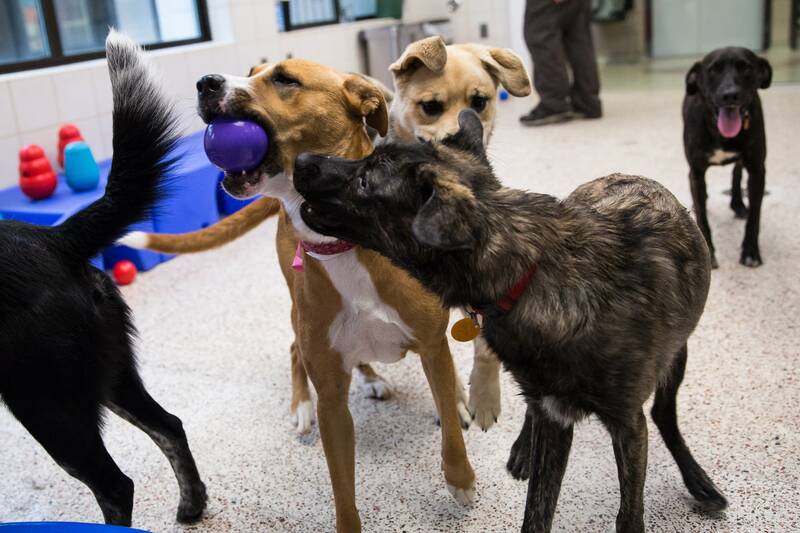 "
If the prototype proves to be successful, the humane society is hopeful it can lead to more group dog housing not just here in the Twin Cities but at shelters across the United States. "It's really an effort to not only transform housing for our animals that we care for on a regular basis, but transform housing across the country that have the ability and can afford to think about doing something different as they're looking at building new facilities for animals," said Dixon. "And it continues to support and develop that human-animal bond in a human way. It isn't just people coming in and walking down the aisle looking at the different animals. It's a way for people to get in and have an interactive experience with dogs."